May is National Teacher Appreciation Month. The Coastal Federation is lucky to call Sandie Cecelski, an influential and respected teacher, a board member. Sandie has spent the last 30 years teaching marine science in New Hanover County. She helped to launch the Marine Science Academy at E.H. Ashley High School, which offers college credit courses in oceanography and marine sciences for students who will eventually attend the University of North Carolina at Wilmington or Cape Fear Community College. 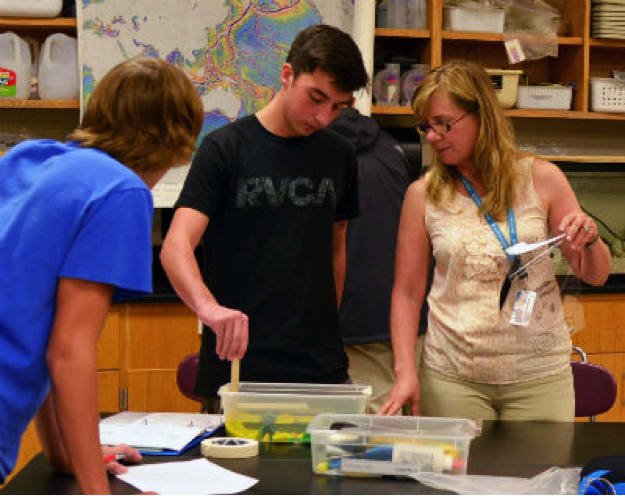 This year, Sandie was named an Educator of the Year in New Hanover County. 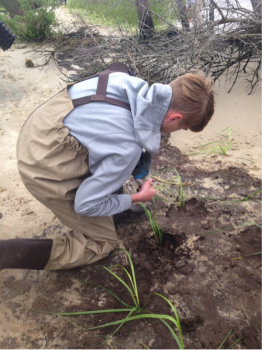 Sandie has empowered many students to become stewards of our coast. One student, Dakota Spurley, has been an active participant in the Coastal Federation’s work. Dakota has decided to dedicate his senior project to oyster restoration and has been working closely with the Coastal Federation. He has been conducting water quality monitoring at our oyster reef at Carolina Beach State Park. He has been going a few times a week for the last several weeks and taking temperature, pH, turbidity, and dissolved oxygen measurements to ensure the healthy maintenance of the reef. He has also been noting tides and weather observations to observe how this can impact the reef. Dakota has also aided the Coastal Federation by fixing displaced oyster bags that have fallen off the reef. This is a 200-foot reef that is designed to create habitat and mitigate erosion as part of our Living Shorelines project. and aided in oyster anatomy dissections. He volunteered at Work on Wilmington, completing rain garden maintenance at Bradley Creek Elementary. Dakota also helped with the Wilmington Regional Association of Realtors Action Day cleaning up the shoreline at Carolina Beach State Park and planting salt marsh grasses to stabilize the living shoreline.